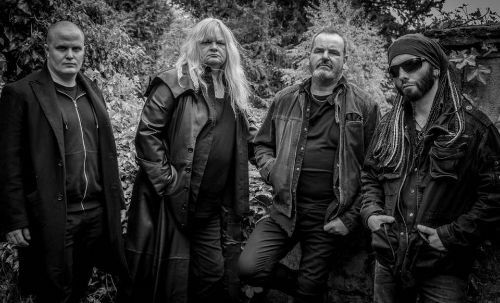 NWOBHM legends Grim Reaper recently released their first new album in almost 30 years. “Walking In The Shadows” was released on 23rd September via Dissonance Productions. 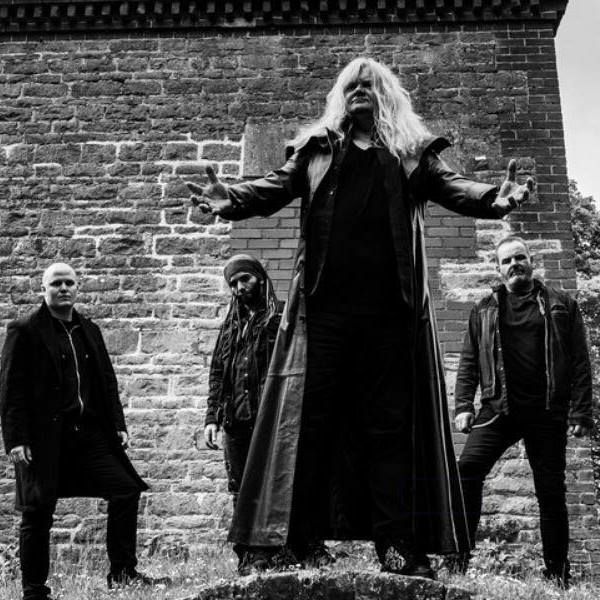 I spoke to vocalist Steve Grimmett via Skype on 27th September - about a week before the band headed out on an extensive North American tour. That interview was included on the Friday NI Rocks Show broadcast on 30th September. We talk about the new album and what the future holds for Grim Reaper. The Show also includes four tracks from the new album. NI ROCKS - Hi Steve, thanks for taking some time to talk to Rock Radio NI. STEVE – You’re very, very welcome! 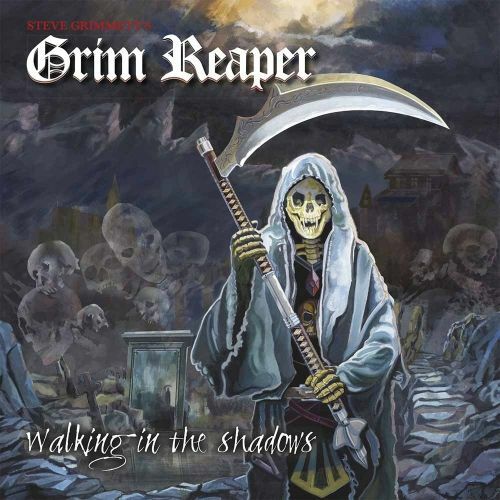 NI ROCKS - Grim Reaper have just released their new album “Walking in The Shadows”. Who worked with you on the recording and production of the new album? STEVE – Ian and I did the production. I recorded all of it, basically, in my studio. Then we had a friend of ours, Pete Newdeck, mix it. NI ROCKS - Did everyone record in the same studio? Quite often these days people record in their own studio and send things in. STEVE – Yes we did. It was all done in my place. We wanted to record old school. It’s all the proper sounds. All the sounds of the instruments. Literally old school. NI ROCKS - You’re heading back out to the States and Canada on tour later this week. Are the band members on tour the same as worked with you in the studio? STEVE – Yes, absolutely they are. We’ve got Paul White on drums – an amazing young drummer. Probably the best drummer I’ve ever worked with; bar none! He’s fantastic. The bass player is Martin (Mart) Trail – he’s a fantastic bass player and together they’re a stunning rhythm section. On guitar we have Ian Nash. He’s been with me for donkey’s years! NI ROCKS - The new album is released through Dissonance Productions. Did they approach you or did you make contact with them? STEVE – They actually approached me. Several times actually. We’d done the second US tour and they got in touch and said ‘we want to do this thing, we want you to sign!’ We said yeah right, OK! Ian and I went down to London to see Steve at Dissonance. I was already sold on the idea as I’ve known Steve for quite some time. He’s one of the good guys in the industry. It was just Ian that needed some persuading. We went down to see Steve and his set up and Ian was blown away! Yeah, let’s do it. A few days later we signed and haven’t looked back really. NI ROCKS - Grim Reaper reformed back in 2006 and there have been rumours of an imminent release since at least 2013. Why has it taken until now to get “Walking In The Shadows” released? STEVE – Finding time was one thing. Getting everybody free and ready to go. We had a couple of member changes too. We brought in Paul and ended up re-recording the drums. And we had a bass player change. We had Chaz Grimaldi as our bass player but he had to take a back burner. He’s an American and he and his wife were over here. His wife was working here but they got to the end of term and had to go home. It became impossible for us to do things easily. We had a chat and said it couldn’t go on like that. Then we came up with Martin. There were lots of little reasons too, but mainly band changes. NI ROCKS – When were most of the tracks that made it onto the album actually written? STEVE – I’ve got two studios. Basically Ian and I got together at my place and wrote from there. We wrote at rehearsals as well – maybe about half a dozen. NI ROCKS – Over the past couple of years? Or do any go back any further? STEVE – No, last couple of years I guess. NI ROCKS - You had an album launch party in The Underworld in London on Friday night (23rd Sept). How’d that go? STEVE – It was awesome actually. We don’t really do a lot of shows in the UK because it is really hard getting bums on seats. It’s a real shame, but we always do well in London. When Dissonance decided to throw us a launch party it was arranged for us to play at The Underworld. It was great and we had a fantastic turn-out. Everybody loved it and they loved the new stuff. We sold loads of albums. It was great. Awesome. NI ROCKS - We’ll play a track from the new album now. Do you want to pick a track for us to play and tell us something about it? STEVE – We’ll pick the first track “Wings of Angels”. Anyone who knows me, knows I’m a bit of a geek when it comes to aircraft and my favourite is the spitfire from World War 2. This is about a RAF pilot during the Battle of Britain. NI ROCKS - As I mentioned earlier, you’re off to the States and Canada shortly, following up on a tour there earlier this year. It looks to be quite an extensive tour with a mix of festivals and club gigs? STEVE – Yeah, it’s quite a selection this time around. We’re dipping in and out of Canada as we go along. I’m really looking forward to it and a lot of people are very stoked about us doing it. A lot of clubs have been getting in touch with our agents saying they want us to play. It has been a really great response this time around. We’ve had two successful tours before this one. The first was a small one when we did about 9 dates over a fortnight. The second one was about a month. This one is almost two months and I can’t wait. It’s going to be awesome. NI ROCKS – Has the new album been released in North America at the same time as in Europe? STEVE – Yes, it was. It was released everywhere at the same time, except in South America where it is being released in January. We’re actually going there; I think it’s the first week of January. We’ve got a month long tour booked out there. That’s really cool too. We’ve done three tours out there as a complete band. We always look forward to that as they’re mental out there. NI ROCKS – Your fan base in America? Is it a mix of the older generation like myself or are there younger fans coming out to see you? STEVE – It is more or less a whole new audience. We do get some guys our age too. It totally shocked me when that happened. We started off doing big tours in South America and it was like that there. After the show we always like to get towelled down and then go out to meet the fans, because without the fans we wouldn’t be doing what we’re doing and wouldn’t be there in the first place. When we did that we couldn’t believe it. On stage when you’re looking out, I said to Ian, I’m sure most of these kids in here are younger than the songs we’re playing (laughs). And it turned out to be true. Which is a great thing really. Rock is still alive because of that. And we seem to be able to do more now. We’re going to Japan and Australia and the one that has shocked me – India! There’s a massive, metal support out there. So we may do India. Who knows! It’s fantastic. NI ROCKS – You don’t hear of many tours going to India. STEVE – No, I know. The only reason I knew was the fact that I’d done a couple of interviews for out there. We got chatting and I asked what the metal scene was like and they said it’s really massive. NI ROCKS - The first three Grim Reaper albums were of course hugely successful. Do you have the full rights to those albums and has there been any discussion of them being re-released through Dissonance Productions? STEVE – No, we don’t have full rights. That still belongs to RCA. Back in the 80’s it was a great time to release albums, but it was a poor time for bands. Basically, when you did a deal with a major they got it for 50 years. RCA still owns it, but it’s a sister label Soundfarm, through Plastichead that release them. Basically, all three albums have never been off the shelves. Somebody releases them, then somebody else releases them. It’s never been back-catalogued as such; you’ve always been able to get them. NI ROCKS – I was looking recently and they can fetch quite a bit of money online. STEVE – Yeah, the vinyls are worth quite a bit of money. Actually it’s this Friday that the vinyl comes out for the new album. It’s a double gate-fold album with picture discs, so it’ll be quite collectable. NI ROCKS – Vinyl is a great format for collecting. STEVE – Absolutely. And it weighs a ton too. It’s in the new weight of vinyl. It’s awesome. I’ve only got a white label copy of it, but obviously I’ve seen the art work and it’s really cool. NI ROCKS – Were there any tracks already recorded or ready to record from 1988 when the band split up? STEVE – We had written stuff, but we left Ebony Records who we were signed too because we were very, very unhappy on the label. They had cheated us out of a lot of money, so we took legal advice and left. They then sued us and we counter-claimed, but basically it meant that we weren’t allowed to work and it all came to a sudden halt. In that time we had written some tracks for a new album but to be fair, with all the crap that was going on, it just wasn’t up to it and I wouldn’t have used any of the songs that came out of it on this new album. It just wasn’t good enough. NI ROCKS – Fans waited a long time for album number 4. I know it has literally just been released, but have you given any thought yet to album number five? STEVE – Yeah I have. Ian and I were talking a few weeks ago and I said ‘we’ll have to come up with another one you realise don’t you?’ and he ‘I know, I know, when are we going to get the time?’ I said not to worry about as I had just got Key Base on iPad and got the interface and everything sorted out so that we could do whilst we’re on the tour bus. (Laughs). NI ROCKS – Keep yourselves busy! STEVE – Yeah, we’ve got to really! At the end of the day that’s the only time that we’re going to get to do it. Otherwise it’ll be another 3 or 4 years and I don’t want to do that. NI ROCKS – We’ll play another track from the new album now. Again do you want to pick one and tell us a little bit about it? STEVE – We’ll do “Temptation”. I spent maybe three years on hard drugs. Actually medication drugs for back problems. I was in tremendous pain and was on drugs for that; and basically got hooked on them. That’s what the song is about – getting hooked and then a few years later, trying to get off them. They were opium based drugs and it wasn’t a very nice time. That’s what it is – “Temptation”. NI ROCKS – These days do you find ourselves mainly listening to the classic rock bands when you get the chance or do find time to listen to some of the newer bands that are out there? STEVE – I do actually. I’ve been revisiting a lot of bands that I liked in the 80’s and have been listening a lot to Whitesnake. But mostly, it would be Dio. I missed the point in the 80’s about Dio and what he was; and I get it now. It was such a major loss to us really and it’s such a shame that we lost the guy. I’ve literally bought everyone of his albums and have been listening to those. Also, I can’t say that he is new, but a guy called Chris Daughtry; he was on the American X-Factor. He didn’t win. I bought his first album and absolutely loved it. I’ve been working on a project at home for a few months and I’ve been listening to him. I decided to buy whatever he had done and downloaded it from iTunes. I can only say that the guy is an absolutely stunning vocalist. He has gone a bit more commercial now which is a bit of a shame, but I like his approach and his voice. He had a great timbre to his voice. So I guess I listen to a lot of vocalists rather than the band. And I still listen to the guy that gave me the inspiration to actually sing, and that’s Elton John. Not a lot of people would probably know that. I really like Elton John and I like the way he writes with Bernie Taupin. He was my inspiration and he is the reason that I sing. He is a fantastic guy. NI ROCKS – Can you remember what the last album was that you bought? STEVE – It would have been Chris Daughtry and “Leave This Town”. I listen to vocalists, I don’t really listen to bands per se and this guy is a great singer. NI ROCKS – Yeah, he played Belfast, I’m sure it’s nearly two years ago now and it was a brilliant show. STEVE – I’d followed him on the American X-Factor and I thought the guy absolutely stormed it. NI ROCKS – A lot of things have changed over the last 40 years or so. Just on a personal level are you glad that you were a band breaking through in the early 80’s rather than trying to do it now? STEVE – In the 80’s it was a lot different. Getting signed was really all you ever wanted to do. When you got signed the belief was that all your problems would be over. That really wasn’t true. That’s when your problems actually start. It’s very true of today really. The first thing you need to do is have a good solicitor or lawyer. You definitely need that. But deals are a lot different these days. In the 80’s, certainly when I was signed, you had up front money and you signed for a lot of money really. And that you used to record your album. What you weren’t told probably, unless you went through a solicitor was that you had to sell x amount of thousands of albums before you even saw a penny. That is still true these days; but for rock, it has all gone underground and unless you’re the new Bon Jovi you’ll find yourself being signed to an independent. The independent will basically want a completed album. So you’ve got to go into a studio at your cost, record it at your cost, get it mixed and mastered at your cost and come up with the finished artwork before most labels will even think about talking to you. That is the difference. But, you will find yourself not owing any money; so as soon as you get released, no matter how many you sell, you get the money from it. That’s a good way; but a lot of independents will release and they’ll be glad to sell 1,500 to 2,000 copies because they’ll be making money on it. But that’s not good enough for you! There are some great labels out there, independent labels, and great guys. You’ve just got to decide in your own heart who you want to use. I would recommend Dissonance anyday – they’re great people. NI ROCKS – In 2015 The Sanity Days released the album “Evil Beyond Belief” but weren’t able to promote it as much as you’d like due to guitarist Al Jordan’s illness. What’s the current position with Al? STEVE – Al is a lot better now. In fact I pretty much think that he’s on top of it all now. The reason that we didn’t of course was that Al got cancer and he had several operations. Then he didn’t seem to be getting any better. He was cancer free but kept getting infections. The poor bloke just wasn’t up to it at all and that was the reason. It was such a shame because the album came out and we couldn’t do anything with it. It was a shame, but Al is on the mend and you never know we may be able to do something with it; we’ll just have to wait and see. Though I’m probably too busy at the minute. NI ROCKS – You have done some production in the past but are there any other projects that you’re involved in or working on at the moment? STEVE – No, not at the moment. We’re just too busy. Next week we’re off to the States, then when we’re back from that we’ve got a gig in Sheffield, I think it’s the Hard Rock Hell Christmas Special in December, then we’ve got Christmas off before heading to South America for a month or possibly 6 weeks. Then its Europe, Japan and Australia; it’s never-ending. (Laughs). NI ROCKS – Thanks again for talking to Rock Radio NI. Good luck with the new album and the upcoming US dates. We’ll finish with another track from the new album. I’ll let you pick one and tell us a little bit about it. STEVE – Can I say just before that, I’d like to thank our fans for their loyal support and hopefully we will see you in 2017 at one show or another. What I wanted to play was the title track from our album “Walking on Shadows”. It’s about those times when the hair stands up on the back of your neck and you turn around thinking there is something there and there isn’t.